UTRGV's Ivan Estrella looks for the ball after a wild throw to tag Texas Tech's Grant Little at second base during the second inning Tuesday, February 27, 2018, in Edinburg. 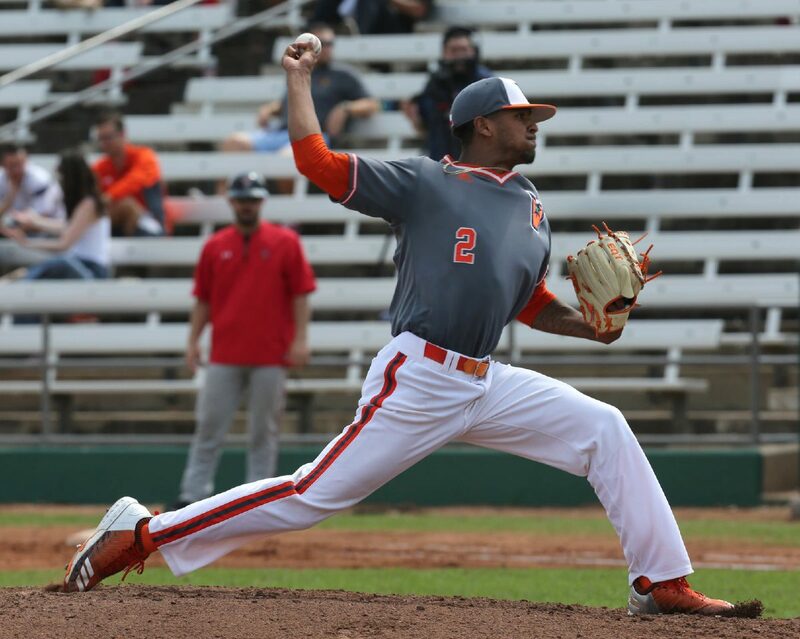 EDINBURG — UTRGV pitcher Trevelle Hill said he entered Tuesday’s game knowing it was the biggest he had ever played. Facing No. 3-ranked Texas Tech in only his second Division I start, Hill stepped to the mound with his trademark fire and intensity. After escaping the eighth inning scoreless despite yielding a leadoff triple, Hill pumped his fist and shouted to himself as he stomped back toward the UTRGV dugout. Hill didn’t even realize how tired he was until after that final trip back to the dugout. In eight innings and 111 pitches — more than his previous three UTRGV outings combined — Hill allowed just three runs on nine hits and one walk with six strikeouts. 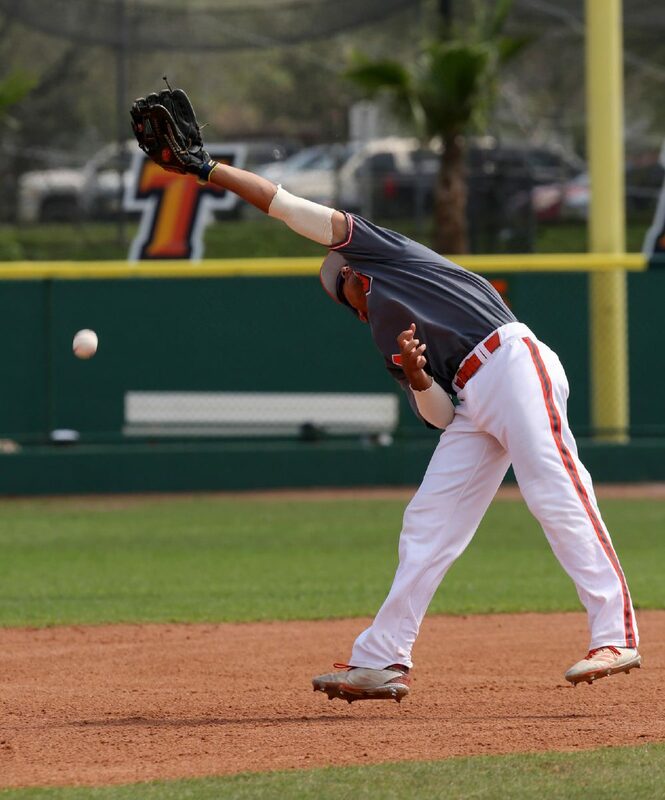 In a 3-1 loss to the undefeated Red Raiders (9-0) on Tuesday at UTRGV Baseball Stadium, Hill’s outing was one of many positives for the Vaqueros (5-4). UTRGV's Trevelle Hill pitches the ball against Texas Tech during the third inning Tuesday, February 27, 2018, in Edinburg. 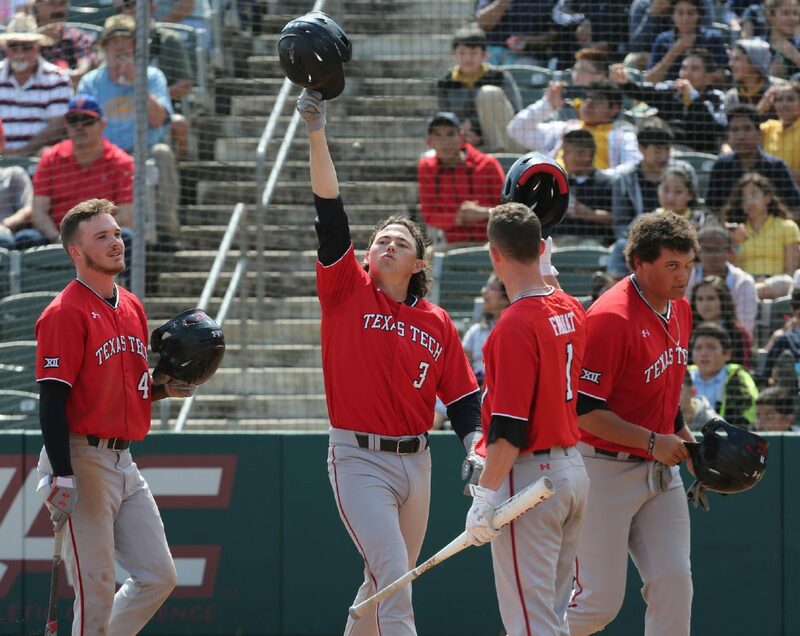 Texas Tech's Michael Davis, center, tips his hat after hitting a three-run home run in the second inning against UTRGV Tuesday, February 27, 2018 in Edinburg. UTRGV's Anthony Gomez strikes out during the third inning against Texas Tech Tuesday, February 27, 2018, in Edinburg. UTRGV's Anthony Gomez misses a Texas Tech fly ball during the third inning Tuesday, February 27, 2018, in Edinburg. 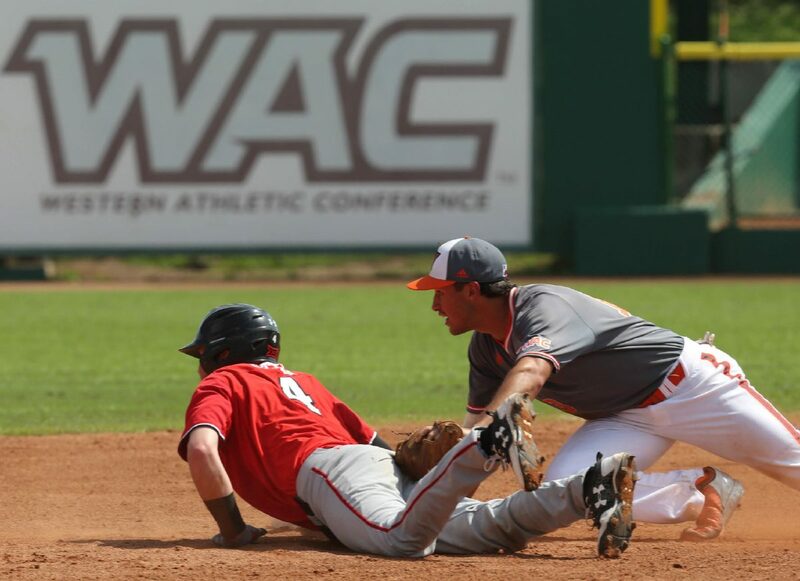 Texas Tech entered the day ranked fourth nationally with 79 runs scored in eight games, and Hill said his aim was to make the Red Raiders as uncomfortable as possible. He wanted to work the inside of the zone and then go outside with his mid-to-high-80s fastball, occasionally mixing in his slider and change-up. Hill yielded all three runs on one swing — a homer by Michael Davis in the second inning. Matlock said the scouting report indicated Davis would be susceptible to the change-up, but by the end of the afternoon Matlock was wishing UTRGV had leaned more on the fastball against him. Hill locked in from there, allowing just three hits over his final six innings. Hill said he felt as strong in the eighth inning as he did in the first, and Matlock had little hesitation about running up Hill’s pitch count if that’s what was necessary to hang with the Red Raiders. Hill has been lauded for coming up with his best pitches in critical situations, and Matlock said Hill took the intensity to a different level against Tech. Matlock called Hill a pleasant surprise on the mound even prior to Tuesday. Combined with three scoreless appearances to start the season, Hill has now thrown 15 2/3 innings with a 1.72 ERA, yielding 13 hits and three walks against 11 strikeouts. This after the junior posted an ERA above 4.00 in each of his two seasons at Pima Community College in Tucson, Arizona. Hill said he’s narrowed his pitch repertoire and quickly taken to the Division I environment and fresh coaching ideas from Matlock. Matlock said Texas Tech starter Ryan Shetter — a returner who ranked second on the team in innings pitched last year — didn’t have his best fastball command, instead resorting to breaking balls on about 80 percent of his offerings. The approach was enough to stymie UTRGV, as Shetter allowed one run on five hits and no walks with eight strikeouts in 5 1/3 innings. He gave way to Jose Quezada, who allowed one hit in 2 2/3 scoreless innings with five strikeouts, and Caleb Freeman, who struck out two of the three batters he faced in a scoreless ninth. 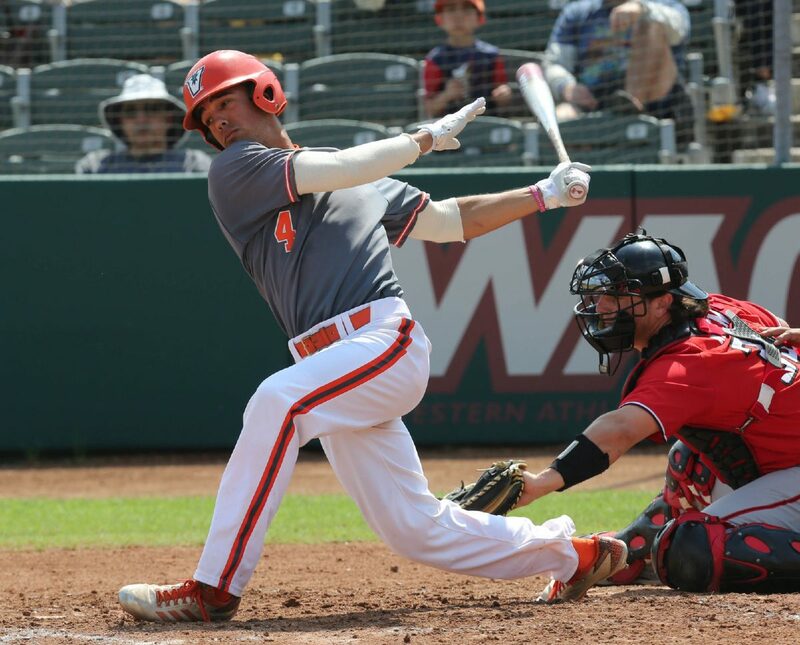 Ivan Estrella was the only UTRGV player to record multiple hits, including an RBI single in the first inning that scored Coleman Grubbs for UTRGV’s lone run. The Vaqueros drop to 5-4 with a loss, capping a stretch of tough tests. UTRGV lost two out of three to Illinois Chicago over the weekend, played 3 1/2 innings against No. 27 Mississippi State in a game that was eventually called on Monday and then hung tough with Texas Tech on Tuesday.